We are the perfect place to shop online for your home or office. We offer art prints, canvas prints, original works, and posters. We are trained professional picture framers, experts at Custom Framing. We are ready to help with all your framing needs. Or perhaps your business could use some art and decor that shows your success and good taste. Visit our Framing For Business page. We also offer an eclectic selection of tasteful Home Decor and accents. Choose from Denali Blankets, and Nostalgic Personalized Signs, and more. And we can do a lot more for you. Visit our Services page. 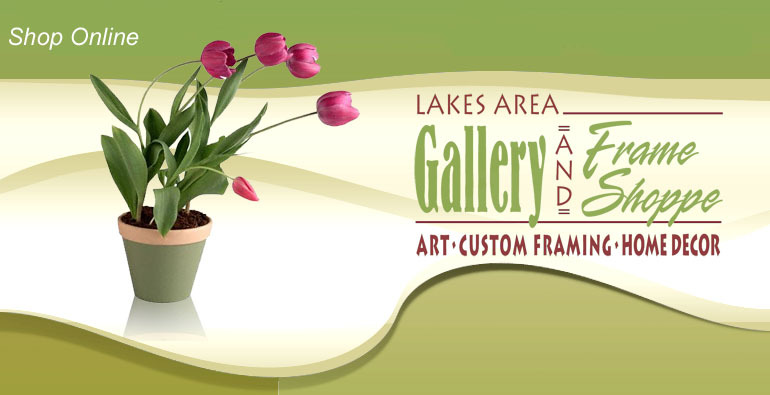 At Lakes Area Gallery and Frame Shoppe, our #1 goal is customer satisfaction. We strive to delight our customers every time. Enjoy! Click Here to see our In-Store Specials!! Breaking News!! We are offering a full line of Denali bedding and pillows. Euro and Standard Shams, Neck Rolls and Plush Square pillows. Choose from 18 solid Bed Skirt colors and DOZENS of Bed Spread patterns. Available in Twin, Full, Queen and King szes. American made in Wisconsin. 2 - 3 Week delivery - from our shop to your home. Available In-Store only.